Happy Valentine's Day lovelies! I hope however you ended up spending today, you had a grand ol' time doing so :) To celebrate, I have two manis to share today! Both are pretty glitter-filled pink milky-base polishes from Lynnderella -- same idea in basic concept but they ended up looking quite different on the nail! I layered both over OPI You Callin' Me A Lyre? a sheer pink jelly. Take a look! 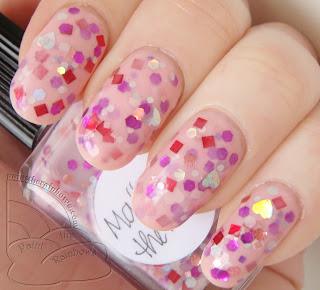 Matter of the Heart is a sheer bubblegum pink base full of various purple, pink, red, and silver shiny/holo hexes and squares as well as silver holo hearts. There was not a whole lot of glitter in the first coat but I think it glittered up quite nicely by the second; these were mostly just regular coats with not much dabbing needed. I will say that I had a hard time snagging the silver hearts out of the bottle and ended up stealing a few from Revlon Heart of Gold FX (which I will post on its own soon enough) so sorry if a few gold microglitters are stuck to the hearts; it doesn't show in person but macro has never been the most forgiving soul :) This one is super fun, super Valentine's Day! 4 coats OPI You Callin' Me a Lyre? Mon Petit Chouchou (My Little Darling/Cabbage Head, depending on whether you listen to Google Translate or Lynn herself... either way adorable name!) is a sheer peachy base with matte/shiny/holo purple, pink, and white hexes, squares, hearts and flowers as well as lavender microglitter. What a mouthful! From the description, it sounds like a lot more going on here than Matter of the Heart, but this one actually has a more mellow look. 3 coats OPI You Callin' Me A Lyre? And a few of OPI You Callin' Me A Lyre? on its own, because I have fallen in love with this polish! I just used it for the first time with these two manis, and while I struggled with some streakiness the first time through, once you figure out how to apply it best (three thick coats, don't let the brush touch the nail if possible, let dry in between coats is what I'd recommend) it is amazing :) Officially my new go-to sheer pink! This is an elegant look for a glitter mani. Beautiful!! I like the combination you did here!